4CITIES Cohort 3 students have analyzed neighbourhoods in Brussels for their classes at the VUB and ULB. The fieldwork aimed at creating a planning profile for four neighborhoods located in the Western part of Brussels near the Canal Zone or with interesting future developments: Heembeek (Bruxelles), Heizel/Heysel (Bruxelles), Oud-Laken Oost /Vieuw Laken Ouest (Laken-Bruxelles), Kuregem Dauw/Cureghem Rosée (Abbatoirs) (Anderlecht). The group that analyzed the Heysel district in the North of Brussels, location of the Atomium, the Expo, Cité Modèle and other historic urban structures, also presented its findings to the Dutch architecture firm KCAP in Rotterdam. 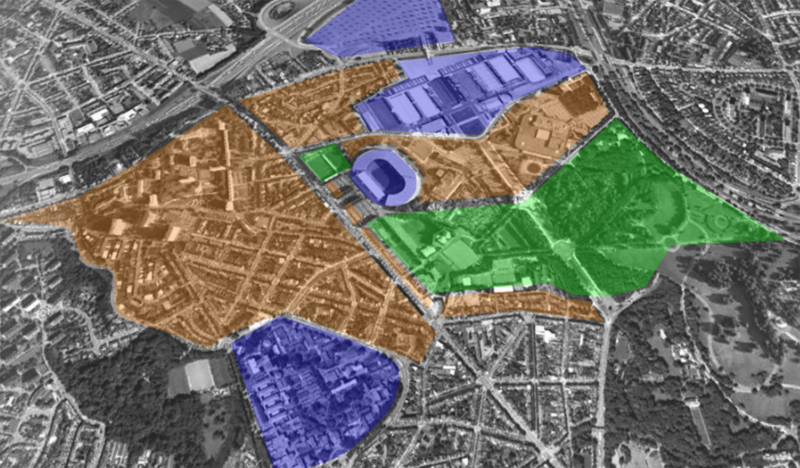 KCAP is an internationally renowned firm that has been appointed to develop the master plan for the Heysel plateau within the NEO project. The presentation was followed up with a report that can be found here. Next Next post: Where did 4Citizens travel to during 4CITIES 2011–2013?